Action movies were never the same after the 1988 release of John McTiernan's seminal Die Hard, the hit that spawned a franchise, transformed Moonlighting star Bruce Willis into an A-list hero and the late, lamented Alan Rickman into arguably the greatest movie villain of all time. When Willis' off-duty New York cop John McClane tackles the terrorists who have hijacked his estranged wife's office Christmas party at the Nakatomi Plaza in Los Angeles, the stage is set for a gripping battle of wills. Alone and shoeless, the self-proclaimed cowboy goes head to head with Rickman's suave, sophisticated Hans Gruber whose (almost) total command of the situation makes one think (on initial viewing) that he will in fact get away with his master plan. Not only an influential action movie, Die Hard is also one of the truly great Christmas movies. The magic of the season is resplendent in most aspects of the storyline, from the festive party setting to the quotes by the characters ("It's Christmas, Theo, it's the time of miracles", purrs Gruber to one of his henchmen), to the input of composer Michael Kamen. Another key figure of film who tragically left us far too early (he passed away in November 2003), Kamen became defined as the action composer of the late 1980s off the back of the Die Hard and Lethal Weapon movies, and James Bond entry Licence to Kill. Although Kamen's best work was arguably in the more melodic realms of drama and fantasy (Brazil, 101 Dalmatians, The Iron Giant, What Dreams May Come et al), he immediately established such a singular action style in such a short space of time that it's the genre for which he's best known. Die Hard is the quintessential Kamen action score: textural, witty and atmospheric with occasional moments of explosive action made all the more powerful by long passages of suspenseful build-up. Clearly cueing off the movie's fiendishly sharp script, Kamen isn't averse to lacing his score with humorous tongue in cheek moments, which in turn accentuates the film's sense of fun. That said, when it came to the final mix Kamen's music was largely shredded by McTiernan, passages used in places where they weren't intended and key pieces dropped altogether (a similar situation befell Alan Silvestri on the director's previous film, Predator). An unused cue from James Horner's Aliens was even used during Die Hard's final scenes, as was John Scott's sweeping score from 1987 cult actioner Man on Fire. Nevertheless there's no denying that the music as heard in the film itself is tremendously effective, surprisingly low-key for the most part as it percolates beneath the action before boiling over during the unforgettable set-pieces. 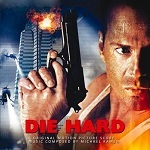 The original 2002 Varese Sarabande pressing of the score (reviewed here) begins with what could be described as McClane's theme in the moody, guitar-inflected 'The Nakatomi Plaza' (unused in the movie), explicitly playing up the character's cowboy associations and a clear influence on Kamen's Licence to Kill a year later. The most significant aspect of the track, and one that extends throughout the score, is the tinkling presence of festive sleigh bells that help reinforce the Christmassy setting. The use of such a whimsical instrument in full-throttle action tracks like 'The Fight' (which ends on desolate, discordant note befitting McClane's first kill in the movie), 'Going After John Again' (subtly escalating in string-led intensity as John is pursued into the seemingly bottomless elevator shafts), 'Welcome to the Party', the mammoth 'Assault on the Tower', 'The Battle' and the enormously powerful 'Gruber's Departure' helps lend the music a distinct touch, both relentless and satirical at once. Few composers would have the intellectual foresight to place bells alongside a thunderous host of horns, trombones, racing strings, anvils and snares, but Kamen pulls it off. The masterful 'Assault on the Tower' in particular is one of the greatest action cues ever composed, never compromising its intensity across eight extraordinary minutes, even when mixing in a tongue in cheek passage for rock and roll and a brief quote of Christmas classic 'Let It Snow' (which also appears at the very end of 'Gruber's Departure', although again it's absent from the film mix). The aforementioned song is even treated to an instrumental suite at the climax of the album, ending things on an agreeably sentimental and uplifting note despite all the carnage that's occurred. (Another Yuletide staple, 'Winter Wonderland', is also quoted throughout.) 'The Battle' is another enormously impressive piece, running a lengthy 10 minutes and encompassing an astonishing array of emotional cue points and rhythmic changes, from militaristic tension to whimsical, Mickey Mouse-style musical punch-lines. 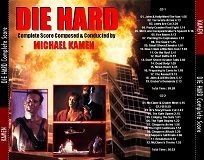 As previously mentioned however much of the score remains on the back-burner, occasional strains of McClane's theme merging with Kamen's signature pizzicato string rhythms and bells in pensive cues like 'John's Escape', 'The Tower', 'The Roof' (which has a fascinating, if brief, organ/electronic passage - just one of the score's many unexpected nuances), 'And If He Alters It? ', 'Have a Few Laughs', 'John is Found Out' and 'Attention Police'. The near endless buildup of such pieces only helps reinforce the power of the action material when it finally arrives. A cue of particular note is the fascinating 'Bill Clay', industrial electronic textures lending tension and uncertainty to McClane and Gruber's first meeting (the latter posing as a hostage). 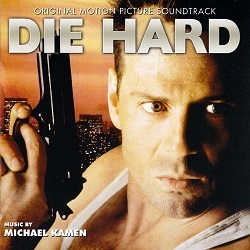 Interwoven around the McClane and Christmas material is that for Gruber himself, an interpolation of 'Ode to Joy' from Beethoven's iconic Ninth Symphony (a request from McTiernan) that makes a full-blooded, chilling statement on trombones in 'Gruber's Arrival' and is a near-constant presence in little fragments thereafter. Used as a signifier of Gruber's classical education and intelligence (revolutionary for an action movie baddie at the time), it's another smart touch from Kamen. Particularly effective is the subtle build-up of the piece in 'He Won't Be Joining Us', a harbinger of the eventual antagonism that spills over between McClane and Gruber. 'Ode to Joy' gets a thunderous, stand-alone reprise late in the album, an ironically celebratory tone ensuing as Gruber's team crack the Nakatomi safe and appear to be within a hair's breadth of pulling off their scheme. By contrast, the yearning tone of the guitar, woodwinds and melancholy strings in 'I Had an Accident' helps humanise our central hero, as well as accentuate his growing friendship with police sergeant Al (Reginald VelJohnson), who's watching things play out from ground level. 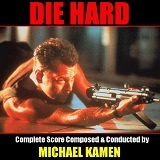 Such contrasting nuances are what make Die Hard an enduringly intelligent and effective score. Kamen clearly wasn't interested in approaching it as a standard action movie and dug into its themes and characters, reflecting the wit and emotional tussle inherent in the script. 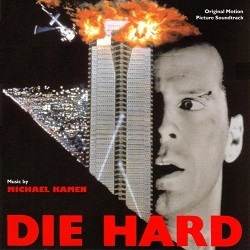 By pitting the different textures for McClane and Gruber against each other, Kamen is able to make their struggle seem all the more dramatic and distinct, whilst at the same time his integration of quintessentially festive material helps remind us this is all fundamentally tongue in cheek. It's a rare action score that blends sincerity and self-parody in a manner that never compromises its respective movie, although one suspects McTiernan dialled down some of Kamen's more eccentric flourishes for that very reason. It's tragic that Kamen is no longer with us, and one hopes that both he and Alan Rickman are sitting on a beach somewhere making sweet music. This review is a testament not only to a great Christmas movie and score, but also to both of their formidable legacies. 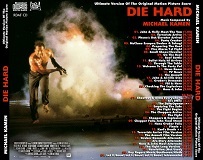 As mentioned, Die Hard was first officially released on CD by Varese Sarabande in 2002, although it only received a limited pressing (3000 copies) and is now something of a prized commodity. Equally prized is the 2011 La-La Land Records Deluxe Edition comprising 2 CDs worth of music, another limited pressing (limited to 3500 copies) and which sold out in two days. Both releases now fetch high prices on the secondary market, and you will occasionally find examples (including bootleg versions, so beware!) on Amazon.co.uk in the UK, and Amazon.com in the US.